There was a man named Percipi standing at the entrance behind the throne room of a great castle. Percipi went into the chamber. 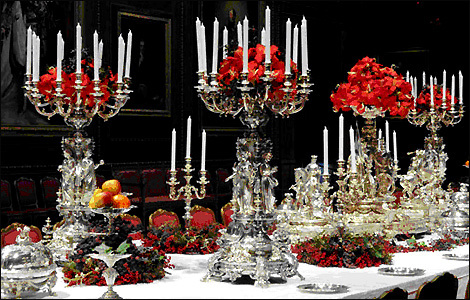 He walked past a table bountifully prepared with the most lavish food made ready for a feast. Percipi continued walking past the feast to a statue that was made with a stone base. Growing out of the stone base were golden wheat stalks intermingled with burnt brown stalks of tare. The tare and wheat grow in stalks of three. Then at the top of the stone stand were three armour suits. The suits were placed left to right. The first armor suite was bronze, the second silver and third armor suit was gold. Percipi went to the statue to pick up a section of wheat stalks. The wheat was a bright yellow golden grain color. Percipi looked at the grain and said to himself “I should keep these as I may need them later.” He then put them in his pocket. Next Percipi looked at the three suits made of precious metal. He stepped toward the golden armor. He reached out his hand to pick up the helmet of gold. He put it on his head and face shield covered his face. He then lifted the face shield so that it would rest in the up position to allow him to see the things he was looking at. Next he put on the gold breast-plate. It fit just right. The golden leg armor and shoes where still on the stone statue. Percipi turn to his left and sees a person fully dressed in the bronze armor that had been in the stone statue. The person in the bronze armor was standing at the door about to go out to battle with his sword out and ready. Percipi turns around in wonder as he never saw another person enter the room. He then hears footsteps and looks up to see another man fully dressed in the silver armor. The silver armor man did not have his sword or helmet on. Instead the silver armor man had a half crown on his head. The silver crown was in the shape of the World Series trophy. The silver crown had multiple vertical settings on the top. The crown of silver had a diamond incrusted in the middle of each vertical rod setting. These diamond settings rested on top of a solid silver bar head band with cut out space design that allow the vertical rods to be seen pointing up. The Silver armor man is laughing at Percipi and walks by him to the door. Percipi wonders to himself how “I do I get my crown.” He went behind the stone statue. He saw on the floor a gold crown that was also made like the silver crown. He took off his helmet and put the gold crown on his head. It slid down over his face so he tilted it up so that it would sit correctly over his head. Percipi also saw a sword sitting on the ground beside a pair of gold armor gloves. He picked up the armor gloves and put them on. He stood up and turned around to look at the statue. There were gold armor shoes remaining on the stone statue that Percipi had not put on. He put them on but still did not go out to battle. Football Season: Husband Wife View-in Together ?